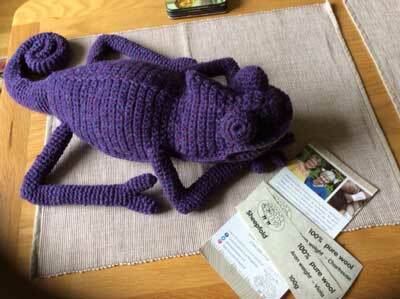 … with her home made wooden buttons on the back. 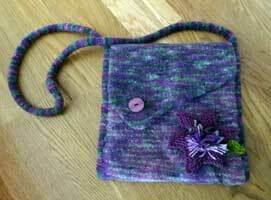 A close up of HB’s completed Fara Bag. 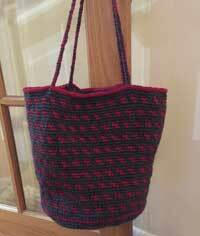 Large shopping tote - the first of three made by Tricia H, so far! Easy Peasy Purse made by Bex who says “... it is amazing ... I’ll be ordering more wool soon so I can make them for my friends”. 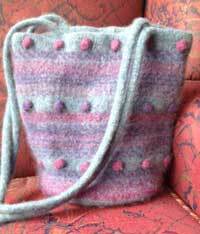 Treasure Bag made by Lucy who says “Finished it! 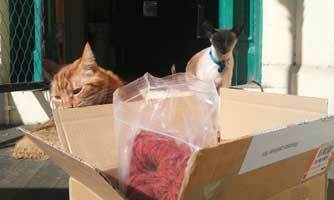 I was so pleased that it was as easy as I was told it would be ...”. 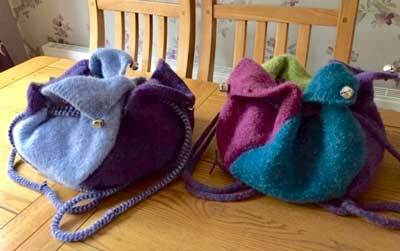 Sheepfold's mosaic bag design - from Alice and Sue's 'Felted Bags' book - made by Gill. 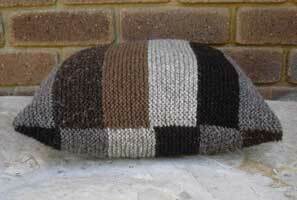 Our Shepherdess's Satchel pattern, knitted in Herdwick. 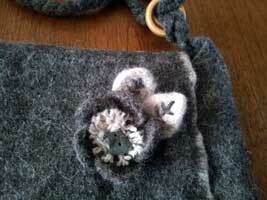 Gill used our corsage pattern for decoration and Sheepfold's Cumbrian slate buttons. 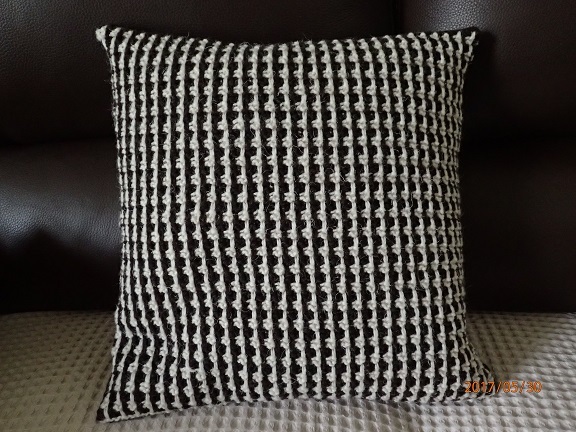 Cushion made by Val with British breed wool from Sheepfold. 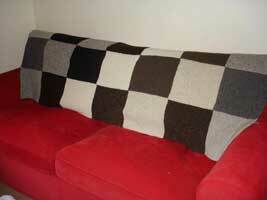 Throw knitted by Val with British breed wool from Sheepfold. Looking wonderful in an Australian home! 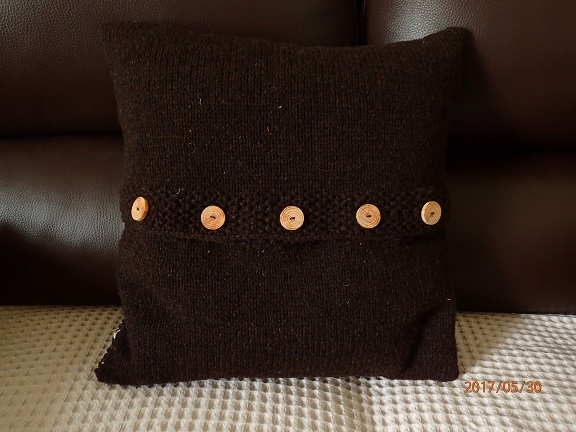 "Really pleased with my lovely limited edition Hebridean Isles wool which travelled all the way to Australia in just five days. 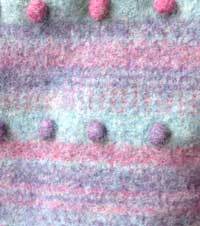 I've recommended Sheepfold to several friends including members of the Handknitters' Guild who love discovering unusual new yarns. — Laura, Melbourne." 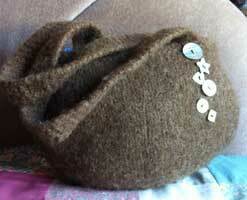 Felted bag made with Sheepfold's Edale Bag Kit in Manx Loaghtan by Sheena. Come on everyone, let us see your end results too! !